Bruks Siwertell demonstrates its commitment to finding solutions for any kind of operation, including the truly massive and adding value through innovative designs and automation. The cargo handling market demonstrates a range of unique elements. No two ports are exactly the same in terms of their cargo mix or volumes, blueprint, or local climate. A founding principle in Bruks Siwertell’s design philosophy is to create new products to serve its customers’ needs, rather than expecting them to adapt their operations to limitations in their equipment. Pressures never cease to become more complex in the industry; the operational boundaries of machines are pushed to their limits, along with owner expectations. Bruks Siwertell engineers relish a challenge; whether it is in terms of protecting the environment; decreasing operating expenditure; improving the longevity of parts; or providing operational scale. Taking all these imperatives into account – with an emphasis on the latter – Bruks Siwertell unveils its highest capacity loader yet. 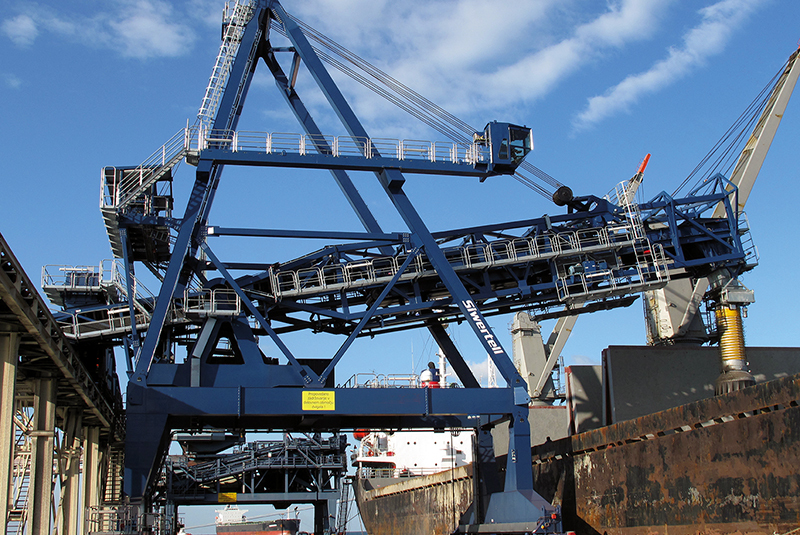 If asked: just how much material can a Siwertell machine load directly into a ship’s holds? Using the new high capacity loader, Bruks Siwertell’s answer is: in the space of an hour, 12,000 metric tons of iron ore, or 8,000 metric tons of coal. The new loader serves some of the largest bulkers in the world; iron ore carriers of up to 300,000 dwt and 230,000 dwt coal carriers. The unrivalled throughput of the high capacity Siwertell ship loader allows a huge number of vessels to be loaded in quick succession, offering minimal berth occupancy, which translates into considerable off-hire and fuel savings, and keeps ship sulfur and NO2 emissions away from ports. “We specialize in developing tailor-made solutions for every bulk material handling application,” says Juha Huovilainen, Sales Director, Siwertell. “The design of the new high capacity loader is based on multiple interviews with global customers operating at the extreme, the most demanding high-volume export terminals. It also represents the culmination of our vast experience in the coal and iron ore industries. To maximize loading efficiency, Bruks Siwertell developed a new loading spout, which loads coal and other bulk material with similar properties underneath hatch coamings and in the corner of hatch openings. 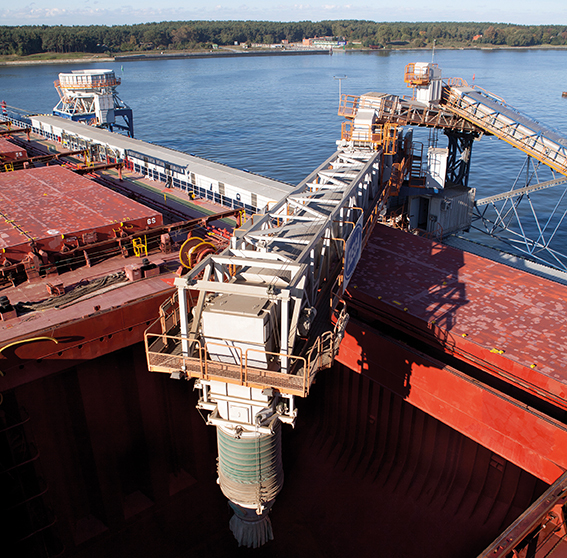 For iron ore, a newly designed deflection device also optimizes the transfer of bulk cargo into the ship’s holds. Like every other Bruks Siwertell application, reliability has been at the forefront of the new loader’s design. Bruks Siwertell has instigated various new innovations to ensure peak operational availability and hand-in-hand with this is ease of maintenance. Notably, loading spouts can be retracted to the jetty for servicing or if repairs are required. Furthermore, the loader can be locked in position to avoid it becoming damaged during high winds. Meanwhile, a travelling cab, which can telescope up to a distance of 16 meters along the loader’s horizontal arm, gives an optimal view of the operation, as well as allows the operator to identify any issues in the – otherwise fully automated – loading process. The high capacity loader also benefits from our specially developed monitoring system, known as SIMON (Siwertell Interface Montoring System); a PC-based human machine interface (HMI) with rapid, remote monitoring capabilities, able to identify potential issues before they emerge and trouble-shoot them if they do occur. The high capacity Siwertell ship loader features a specially-designed shuttle conveyor system, which has no transfer points between belts. This delivers efficient, long-distance conveying without any cargo losses. An optional dust cover prevents any emission of coal dust to the surrounding environment.